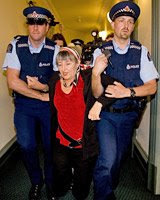 The police have arrested a Penny Bright, scheduled to speak at ACT's annual conference in Auckland this weekend. A veteran activist, Ms Bright, was due to address ACT's conference on freedom of speech on Saturday afternoon. Penny Bright arrested after she refusing to leave the debating chamber when the Auckland City Council went into closed session last night. Will Ms Bright be released in time? Will ACT party members have to pass the bucket to bail her out? Will free market ACT members have to spring a socialist, arrested for opposing the partial sale of Auckland Airport to foreign interests, so that she may lecture them on free speech? No, I wont say it. I knew it! ACT has links to the Worker Communist League aka the Weasels. ACT seems to have lost its edge. If it really wanted to pack the punters in it would have invited Val Morse to do her most spectacular protest demonstration.